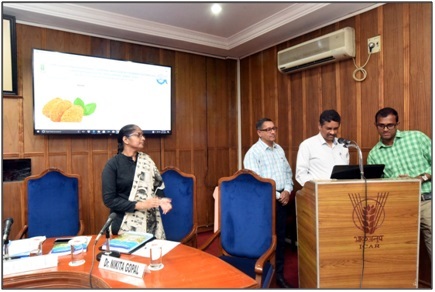 ICAR-CIFT has developedCIFTFISHPRO- a web based information system on CIFT value added fish productsand the same was released by Shri. K. S. Srinivas, IAS, Chairman, MPEDA, Ministry of commerce and industry, Govt. of India on 22nd November 2018.CIFTFISHPRO is an interactive information system, which provides information on series of values added fish products viz: coated products, marinated products, extruded products, wrapped products, cured products and other products like fish sausage and prawn chutney powder. This series of fish products gives an introduction about the products, information about ingredients and stepwise method of preparation of the product. One interactive feature of CIFTFISHPRO is that the system will help the user to upscale the production of each product by automatically calculating the ingredients requirement for a given quantity of raw fish. The system also gives an option to the user to enter the input cost of the ingredients. This would give the user a broad idea about the total cost incurred while up-scaling the production of the product. This also contains a contact form through which user can post any query by just mentioning name, e-mail id and content of the query; this would enable the experts from CIFT to give a prompt reply to the query.This information system has already got copyright registration from copyright office, Govt. of India and it is available in the urlhttp://ciftfishpro.cift.res.in/.